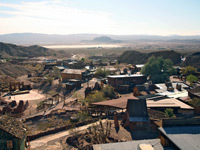 The early history of Calico is similar to that of hundreds of other Southwest mining towns, starting with a period of quick growth followed by a brief boom time then a rapid decline as the mines, in this case silver and borax, became less profitable. Calico was soon abandoned and left to gradually decay in the desert sun until little remained, but in 1951 it was purchased by Walter Knott, an ex-miner (who also founded Knott's Berry Farm at Buena Park) and rebuilt as a modern 'ghost town'. 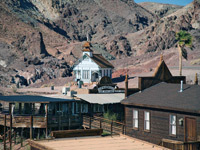 The site is now a thriving tourist attraction, and is quite interesting to visit despite being neither original nor very atmospheric, as only about four of the buildings are largely unchanged from the mining era, and the whole place is rather commercialized. Some of the replica houses have only a frontage, as if part of a movie set. Calico is easily reached, being 4 miles from I-15 near the I-40 junction, 12 miles east of Barstow and half way between Los Angeles & Las Vegas. Calico has a suitably desert-like setting at the edge of arid hills on the north side of the wide expanses of Mojave Valley. The hillsides are quite devoid of any vegetation so the rocks are fully exposed, and the mineral content is evident from the deep red/purple colors of some of the outcrops. Part of the hills around town are formed of sharply folded and twisted strata, further evidence of past metamorphic activity. The town is reached by a loop road running between exits 191 and 194 of I-15, then by a short spur ending at a carpark. Opening hours are 8 am to dusk, though the shops close at 5 pm, and current fees (2019) are $12 for adults or $6 for children over four. The one main street through town is lined with about 30 replica wooden/adobe buildings, some used as gift shops or cafes, and including a jail, blacksmiths shop, saloon, drug store, candle shop, museum & stables. Higher up in the hills are various mine buildings, plus the shafts/tunnels of the actual mine, one of which may be visited as part of a guided tour. Various pieces of original or restored equipment are scattered around the houses, such as carriages and mining tools, and large (artificially-planted) ferocacti add to the desert experience. Other activities on offer (for additional payment) are panning for gold, catching a play at the theater, watching cowboys stage mock gunfights, or riding a narrow gauge steam train. Regular special events are staged a few days each month, such as music festivals, civil war re-enactments or western parades. Calico has a large, full service campground and RV site set on a patch of bare red earth; free camping is available a few miles away along several tracks leading north further into the mountains, in the general direction of Rainbow Basin. Twelve miles west, Barstow has a good selection of hotels and motels. 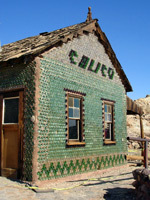 Mining at Calico began after discovery of large amounts of silver ore in 1881, soon attracting a population of 1,200. Over 500 separate mines were developed in the nearby hills, producing $86 million of silver. At its peak Calico had 22 saloons, its own Chinatown and a red light district, amongst many other facilities. Borax was also mined, until 1907 when production switched to more profitable sites in Death Valley, a few years after prices for silver fell dramatically making the main operation uneconomical. The site was nearly deserted by 1929. After the reconstruction instigated by Walter Knott, the town was donated to San Bernadino Country in 1966 and became a regional park a few years later.